"Drilling overwhelms agency protecting America’s lands" was first published by The Texas Tribune, a nonprofit, nonpartisan media organization that informs Texans — and engages with them — about public policy, politics, government and statewide issues. Drilling overwhelms agency protecting America’s lands By Rachel Leven, Center for Public Integrity November 13, 2018 CARLSBAD, N.M. — Wayne Smith was hardened to a certain level of chaos here, on land the American public owns. But even he was incredulous as he surveyed an area he leases for grazing, now cleared of grass and cluttered with above-ground pipelines, a drill pad for multiple wells and other oil and gas infrastructure. “I still pay a grazing lease right there,” Smith said in May, pointing to a government map showing there should be no more than 17 acres of development on the site instead of the 125 acres he saw in front of him. “Now, what’s my cow going to eat?” This isn’t what’s supposed to happen on publicly owned land the federal government oversees. The Bureau of Land Management can lease the same property to more than one party at once, but if New Mexico ranchers request it — as Smith did — the agency has instructed its field offices to contact them before such a build-up occurs. Smith said no one notified him. The BLM declined to comment on the matter. Violations, from oil spills to haphazard land restoration, are becoming more common in this hotbed of oil and gas activity, according to ranchers and conservation groups. One sign of the area’s increasing appeal for drilling: A September federal oil and gas lease sale brought in a record-breaking $972 million. A local BLM official, Jim Stovall, has admitted his team doesn't have the resources to enforce all the rules on the books, according to people who heard his remarks. Fixing these problems isn’t the Trump administration’s priority. Instead, it’s working to speed up oil and gas permitting and open tens of thousands of additional acres to drilling here. For years, the industry in New Mexico has had outsize access to local BLM officials — federal employees relying on the private sector for everything from money to expertise. Now, it’s getting assistance from Washington. “We want to make the BLM a better business partner for the oil and gas industry,” Michael Nedd, then-acting director of the agency, said last year at the Carlsbad Mayor’s Energy Summit. Conservationists, ranchers and others worry that allowing more drilling without addressing the problems already created by ramped-up production could threaten one of the most biologically diverse deserts in the world and scar the land so it can’t be used for other purposes afterward. As the Trump administration calls for “energy dominance,” some here fear their way of life will become collateral damage. The conflict is happening against a backdrop of record U.S. production of oil and gas, juiced by demand from international markets that federal rule changes opened up to American firms earlier in the decade. Much of what’s being sent abroad comes from the Permian Basin, a geologic formation in West Texas and southeastern New Mexico that includes about 2 million acres of land and 3 million acres of minerals such as oil and gas managed by the BLM around Carlsbad. In New Mexico, production is occurring ever closer to Carlsbad Caverns National Park, a United Nations World Heritage Site with more than 119 caves and 33,000 acres of desert wilderness, threatening air quality and the habitats of endangered birds. An industry group that calls its close relationship with regulators an appropriate effort to help the BLM work more effectively says accelerating permitting will bring much-needed jobs and money to the area. Federal and state officials tend to see it the same way. New Mexico is heavily dependent on oil and gas revenue, and the permitting process, some say, has been hijacked by anti-development interests. Wayne Smith (foreground) and business partner J.W. 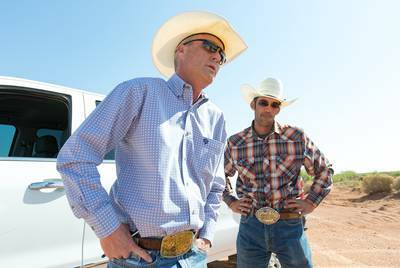 Todd, pictured on May 24, 2018, have objected to the way the federal government manages oil production on public land that ranchers also lease in southeastern New Mexico. Robin Zielinski for the Center for Public Integrity “Texas was blessed, not just with a larger portion of the basin, but also with no federal lands,” Ken McQueen, cabinet secretary of the Energy, Minerals and Natural Resources Department of New Mexico, told members of Congress in June. “In Texas you can have a permit and a rig on location quicker than you can fill out the paperwork to drill a well on federal acreage in New Mexico.” But people are using that land for other purposes, too. The Smiths, for instance, have ranched here for generations. They own property, but leasing public land is a key part of their cattle operation — true of many ranchers in the area. Before Wayne Smith died in October at age 47, he kept calling the BLM, asking for help — trying to make the system work. He wasn’t getting anywhere. “We can’t stop anything that’s happening now,” he said about five months before his death from undetermined causes. “We can only survive. And there’s a point where survival is not there anymore.” The once-in-a-generation opportunity Downtown Carlsbad looks almost like a child’s diorama. The sky is huge and bright blue, with clouds as fluffy as cotton balls, and the buildings — few more than three stories high — leave plenty of room to appreciate the natural backdrop. It’s a small city in the Chihuahuan Desert, and it feels that way. But a messier reality keeps jutting in. The sign warning, “US 285 South Subject to Sinkhole 1000 Feet Ahead,” erected because a brine well for oil and gas operations created a cavern underground that could collapse. The flames of flares, orange against the night sky as they burn off excess gas, contributing to air pollution and climate change. The above-ground pipelines snaking along the reddish-brown soil. More is coming. 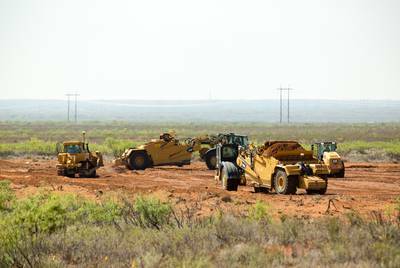 Public land near Carlsbad, N.M., is cleared for oil and gas development on May 24, 2018. Wayne Smith, who leased it for ranching before his death in October, said he never received notification of the construction there. Robin Zielinski for the Center for Public Integrity Every 15 to 20 years, the BLM can reconsider how swaths of public land can be used — what parts should be protected and where various business activities should be allowed. The agency’s Carlsbad field office is doing that now. Among the BLM’s 33 field offices, it’s already one of the five most active for federal onshore oil and gas permitting. More than half the available oil and gas minerals are already leased, according to an analysis by The Wilderness Society. Now it is proposing to open nearly 86,000 additional acres — about the size of the nearby Guadalupe Mountains National Park — to development, including oil and gas. As justification, the BLM cited a 2017 executive order from President Donald Trump to “remove barriers to economic prosperity and quality of life in rural America.” The BLM said it expects the plan would lead to about 15,600 jobs within 20 years. That’s almost 2,500 more jobs than it thinks would be created under the current leasing scheme. “It is in the hottest oil and gas area of the country,” said Kathleen Sgamma, president of the Western Energy Alliance, a trade group. “It’s going to garner a lot of interest from industry … and environmental groups, many of which want to shut down oil and gas development.” The Trump administration’s changes reflect a broader trend to undo Obama-era environmental protections for public lands, including a rule that aimed to reduce greenhouse gases and toxic air pollution from industry flaring. More than half the flaring of gas on federal and Indian land occurs in New Mexico and North Dakota, according to the BLM. Agency officials in both Washington and New Mexico declined to answer specific questions for this article, instead releasing a short statement saying they are “committed to sustainably developing our Nation’s energy and natural resources.” Activities on federal land in New Mexico supported more than 78,000 jobs and generated $14.9 billion in the 2017 fiscal year, the BLM wrote, without explaining how it calculated the numbers. “Through balanced management, the BLM develops resources while maintaining healthy ecosystems, ensuring access for recreational opportunities, and preserving cultural resources and iconic landscapes,” the agency wrote in its statement to the Center for Public Integrity. The BLM’s plan to expand drilling areas could have long-lasting effects. Some are global — increasing planet-warming greenhouse gases worsens drought and other natural disasters — but other consequences are strictly local. Much of the area regulated by the field office rests upon a porous limestone known as karst. Instead of being encased in layers of sand or soil that act as natural filters, water in karst aquifers flows through caves and cave-like passageways, allowing pollutants to move farther and faster. The field office has known for years, thanks to an internal study, that drilling in these areas could lead to contamination of water supplies. But Jim Goodbar, the BLM employee who conducted that study before retiring at the end of 2017, said it left unanswered key questions about which areas are most at risk. He told the Center for Public Integrity the agency never approved his requests to fund additional studies. 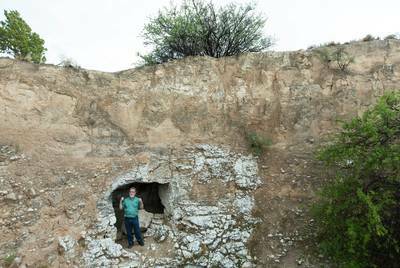 George Veni, executive director of the National Cave and Karst Research Institute, stands above a stream that flows out of Parks Ranch Cave near Carlsbad, N.M., on May 23, 2018. The cave is an example of karst, a porous limestone. Robin Zielinski for the Center for Public Integrity The BLM does have some regulatory protections for karst areas. But it’s allowing more drilling in this sensitive landscape without understanding how impacts could vary by location. Experts say this puts the area’s already scarce water supply at risk. “You screw up and it could have really serious — life-threatening, potentially — repercussions,” said George Veni, executive director of the National Cave and Karst Research Institute. The Carlsbad field office received nearly 100 more applications to drill during the first 10 months of the 2018 fiscal year than in all of fiscal 2017, records released under a Freedom of Information Act request show — 885 applications total. And while there is a backlog in the field office’s queue, in part due to computer software problems, permitting is speeding up. Still, the BLM is hard-pressed to keep up with an oil boom that’s one of the biggest the area has ever witnessed. Stovall, the district manager overseeing Carlsbad and another field office, acknowledged at a meeting hosted by a think tank and a conservation group in May that the Carlsbad office doesn’t have enough money or staff to enforce all the regulations for activity occurring on the land it manages, according to five people in attendance. BLM officials are so overwhelmed that they have given out conflicting numbers on their permitting activities. For example, the BLM provided the Center for Public Integrity data through a public-records request showing that in fiscal year 2016 its Carlsbad field office approved fewer than 400 applications for drilling. Nedd, with the BLM, said at the Carlsbad summit last year that the field office had approved 910 in the same period, while another BLM official a few months before said the office approved just over 800. The agency didn’t respond to questions about these and other discrepancies. Documents the BLM provided to the Center through a public-records request show no penalties levied for nearly 95 percent of oil and gas violations identified by the Carlsbad office over a five-year period ending in April. This assumes the agency is accurately recording its enforcement activities. It wouldn’t clarify. The Carlsbad field office has signaled its priorities through staffing: As of April 2017, only 15 of 98 people in the office were assessing proposed oil and gas projects’ impacts on wildlife, range land and other natural resources, a requirement under the National Environmental Policy Act. By this year, the office had grown to 106, but the number of resources staff appeared to be about the same, lists provided to the Center through a public-records request show. The office needs that information “to inform the decisions that are being made,” said Nada Culver, senior counsel and director of The Wilderness Society’s BLM Action Center. “It’s hard to believe that can happen if there’s that much of an imbalance in the staffing.” Fears about inadequate reviews are well founded, recent history suggests. In late 2016, the Carlsbad field office approved a major project allowing Chevron to drill more than 400 wells on nearly 9,000 acres of federal land. 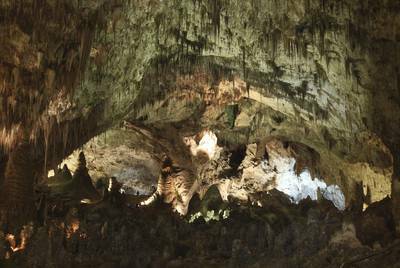 The office, disregarding National Park Service concerns about the nearby Carlsbad Caverns, said the project wouldn’t have a significant effect on the environment. According to conservation groups’ appeal documents, the BLM also kept the process secret; only because of an anonymous tip did the New Mexico Wilderness Alliance, The Wilderness Society and other groups find out about the plan. Chevron declined to comment. In a 2017 letter to those conservation groups, the field office reiterated its commitment to public input in its decision-making. Workers repair oil and gas equipment on public land near Carlsbad, N.M., on May 24, 2018. Robin Zielinski for the Center for Public Integrity But in January the Trump administration sent a memo to BLM field offices, eliminating a required 30-day public comment period before land is leased. And in June, the BLM issued a bulletin directing field offices to skip in-depth environmental assessments for oil and gas projects whenever possible — something the industry asked for. This “calls into question the adequacy of the process and how much they are putting a thumb on the scale in terms of energy dominance,” said Brent Keith, senior policy advisor for The Nature Conservancy. The industry disagrees. The administration is simply directing the BLM to follow the law and bypass duplicative reviews, oil and gas groups said. “This is a prudent step that would allow BLM to be more effective and timely in processing applications and permits,” wrote Robert McEntyre, a spokesman for the New Mexico Oil and Gas Association, which has more than 1,000 members. A helping hand As it struggles to keep up with demands here, the BLM has sought assistance from an outside source that’s been happy to oblige: the oil and gas industry. Deep ties between the two predate the Trump administration. 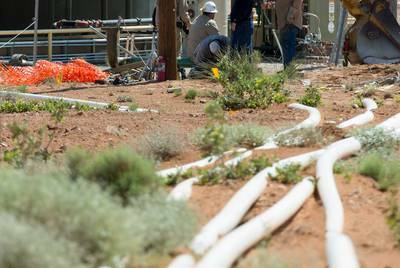 In 2014, during the last boom, the New Mexico Oil and Gas Association donated $800,000 to the BLM’s state office in Santa Fe to help plug holes created by Washington budget cuts. The BLM used the money to hire more employees in the state, then reported to the trade group how many of these “NMOGA” positions and certain other agency jobs in New Mexico were filled, according to documents the Center obtained through public-records requests. The agreement was for only one year. But the trade group’s disproportionate access to the bureau continues to this day. The oil and gas association has created “working groups” for its members to discuss bureau policy, like the land use planning process the Carlsbad field office is working on now. BLM officials regularly attend the meetings, according to current and former employees and documents obtained under the Freedom of Information Act. The BLM would not comment on the matter or say whether these meetings are open to the public. McEntyre, with the oil and gas association, said most of the meetings the trade group holds are open only to its members. In some cases, he said, parts of these events are open to non-members. A sportsman’s group representative who got wind of the meetings asked BLM district manager Stovall last December if he could attend one that was scheduled for January, according to emails released through public-records requests to the environmental group WildEarth Guardians and shared with the Center. Stovall, who said in internal emails to BLM staffers that he planned to go, never responded. Some companies, including Devon Energy and Occidental, have separate, quarterly meetings with staff in Stovall’s district — to discuss development plans or offer help to the agency. Emails show Stovall has gone to dinner with company officials the night before some of those meetings. The BLM declined to make Stovall available for an interview. The industry has also recruited from the BLM for its own leadership — prompting an internal investigation in one case. A 2013 review by the U.S. Department of the Interior’s Office of Inspector General, after former BLM official Steve Henke was hired to lead the New Mexico Oil and Gas Association, found that Henke might have violated federal law and agency policies by failing “to act impartially in performance of his official duties” and inappropriately accepting gifts and meals from outside sources. Henke, who couldn’t be reached for comment, told E&E; News in 2016 that the inspector general’s report was “political” and denied any wrongdoing. In managing lands, the BLM must sort through conflicting ideas about what, exactly, is in the public interest. Giving one industry lopsided access can lead to decisions that are, or seem to be, skewed, legal experts said. “If it appears they’re not acting impartially, then it undermines public confidence in the process,” said Virginia Canter, chief ethics counsel at the Citizens for Responsibility and Ethics in Washington, a government watchdog group based in D.C. The New Mexico Oil and Gas Association and some current and former BLM officials say there’s nothing nefarious about their interactions. Field office staff need to meet frequently with oil and gas companies because they have a significant impact on the land, an office employee told the Center on condition of anonymity because of a ban on speaking to the national media. Companies also have the expertise to advise the BLM how to address problems, current and former officials said. The BLM’s work is “integral” to oil and gas production in the state because much of it occurs on federal land, wrote McEntyre, the spokesman for the oil and gas association. “NMOGA and our members have a vested interest in how BLM performs its work, and it only makes sense that producers, as their largest customers, would work collaboratively to safely produce energy in New Mexico,” he wrote. Jesse Juen, who signed the $800,000 donation agreement with industry when he was the BLM New Mexico state office director, said the agency needed the money to beef up enforcement and compliance. The arrangement was carefully vetted, said Juen, now a board member of the Public Lands Foundation, a nonprofit whose members are largely current and former BLM employees. “I never viewed the effort as catering to industry, but looked at it as an opportunity to help better manage the public lands on all fronts,” Juen wrote in an email to the Center. But Mark Squillace, a professor at the University of Colorado Law School, found the document memorializing the donation problematic. He pointed to a box the New Mexico oil and gas group checked on the donation form, stating it didn’t have business in front of the BLM, including permits or leases. If some of its members did, the group did not note it. If members did have business with the agency at the time, this form would be “at best, misleading, and at worst, fraudulent,” according to Squillace, who served as a special assistant with the Interior Department’s solicitor’s office during the Clinton administration. The irony, Squillace said, is that the government can recover permit-processing costs, including for environmental assessments, through fees from applicants. A donation shouldn’t be necessary, he said. “The way this plays out is that these organizations are in the position of appearing to do a favor for the government,” Squillace said. “But it’s hard to avoid the conclusion that it’s being done in a way that pushes the BLM to support the [oil and gas industry’s] agenda.” The New Mexico Oil and Gas Association said it gave the money because the Obama administration “failed to support local BLM offices.” The donation followed applicable guidelines and was intended to be used for staff and technology at the Carlsbad field office to help meet required processing deadlines and improve agency performance, McEntyre wrote in the association’s statement. “This should serve as a model,” he wrote. The Center identified at least two other oil and gas associations that have made similar donations to the BLM. One, the Oklahoma Oil and Gas Association, said in a written statement that the average permit processing time in the Oklahoma field office has dropped significantly since the donation was made, without preferential treatment for members of the trade group or “improper influence on regulators.” Carlsbad Caverns National Park’s Big Room, eerie and otherworldly, on Dec. 18, 2010. National Park Service staffers worry that pollution from oil and gas production will harm native plants and wildlife at the park, which includes 33,000 acres of wilderness. Susan Montoya Bryan/AP Struggling to adjust Carlsbad is best known for its namesake caverns, part of a fossil reef that 265 million years ago formed the coastline of an inland sea. Inside the park’s Big Room, among the largest cave chambers in North America, backlit rocks jut out from above and below, eerie and otherworldly. Aboveground, the views are similarly spectacular, a desert wilderness of weathered rocks covered in yellow grass, dotted with flowering cacti. But development isn’t far off. Flares on the side of the road are less than 10 miles away. The National Park Service said “excellent air quality is critical” for the area around the caverns, and it’s begun using a portable monitor to detect ozone — a type of air pollution that’s bad for sensitive plants and people’s lungs — as oil and gas activities increase. In 2016, the agency warned in a letter to the BLM that the park was at a tipping point; as drilling moved closer, staffers worried about nitrogen emissions that would harm native plants and wildlife. The agency also expressed concerns that light pollution from these operations puts at risk the park’s population of bats. Drilling will hurt the local economy in the long term because it will dissuade tourists from coming, said Ernie Atencio, the New Mexico senior program manager for the National Parks Conservation Association. Carlsbad is the gateway community for both the caverns and Guadalupe Mountains National Park, which together had some 745,000 visitors in 2017. There’s plenty of support for drilling here. But, Atencio said, “someday we will run out of oil. Do we really want to ruin all of these other resources and special places that have taken millions of years to develop for the short-term benefit of oil and gas?” Hunters report seeing less game on public lands than they used to, and the acreage on which they can hunt has shrunk, said John Cornell, the New Mexico field representative for the Theodore Roosevelt Conservation Partnership. The National Park Service and conservation groups worry that vulnerable species, like the Mexican spotted owl, could see their habitats destroyed. And ranchers, even those who have benefited financially from oil and gas operations on their land, say they are getting overrun in the fossil-fuel rush. Smith started a business to help his fellow ranchers deal with problems, such as companies cutting fences, causing cattle to scatter. Smith’s business partner, J.W. Todd, supports drilling. He likes the idea of “energy freedom” the Trump administration is pitching — but not how it’s playing out. He wants to own a ranch. After years of traveling for work, he’s getting closer to that goal and now leases one near Carlsbad. Most evenings he sits with his wife and son in their yard and watches the sun set. It’s his idea of paradise: “I always envisioned myself being a cowboy out in the West, where you can ride for days and just see grass and countryside.” But Todd knows oil and gas production is only expected to grow. “If the magnitude is what they say it will be,” he said, “we won’t be able to adjust.” Photojournalist Robin Zielinski contributed to this article. Read related Tribune coverage As oil and gas exports surge, West Texas becomes the world’s “extraction colony” How Washington unleashed fossil-fuel exports and sold out on climate New Mexico official says Texas landowners are “stealing” millions of gallons of water and selling it back for fracking "Drilling overwhelms agency protecting America’s lands" was first published at by The Texas Tribune, a nonprofit, nonpartisan media organization that informs Texans — and engages with them — about public policy, politics, government and statewide issues. Link back to the original article, which is located at https://www.texastribune.org/2018/11/13/new-mexico-drilling-oil-gas-overwhelms-agency-protecting-land/.